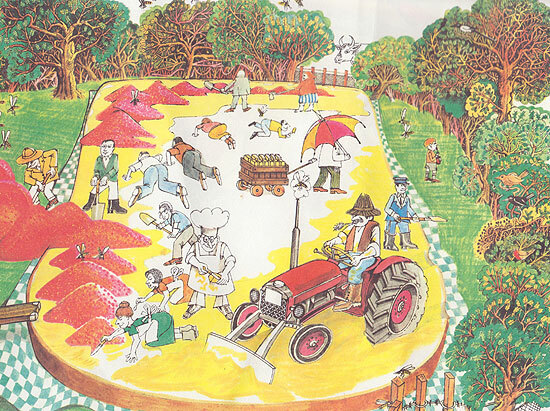 When I was a little kid, way back in the 1980s, I used to read this book in the library about a giant jam sandwich. Years went by and when I was in high school, I began to wonder what that book was called. 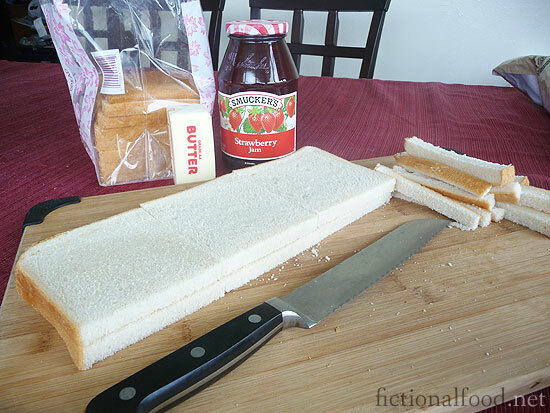 In college, I took to the internet and finally found it and funnily enough, it was simply called The Giant Jam Sandwich . I bought it, telling myself it was for when I had kids, but really it was for me, too. If you’re looking for a good book to give to kids this Christmas, trust me that they’ll love this one! Later, when I did have kids, I read it to them a lot. Our paperback copy is all ratty because my daughter, once she learned to crawl, used to like eating books for some strange reason. 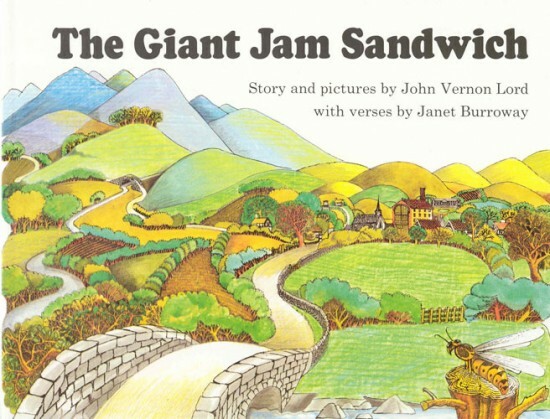 But years later, we still have it and when I told my daughter we were going to make a giant jam sandwich, she immediately ran to get the book and read it again right there for herself, since she can read on her own now. She was very excited that we would be making one. The story is about a town called Itching Down and one day, four millions wasps fly in and terrorize the villagers. None of them know what to do. And cried, “What do wasps like best to eat? Strawberry jam! Now wait a minute! And so the town set out to bake a huge loaf of bread to make a huge sandwich trap for the wasps. Spoon and spades! Slap and slam! 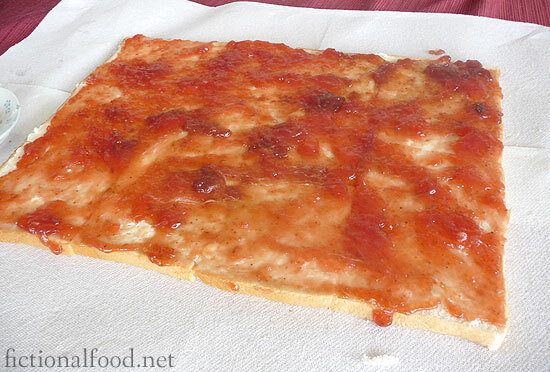 And they did the same with the strawberry jam. Even though we couldn’t make a sandwich to scale like in the book, we did manage to make a really giant sandwich! We ended up using 24 slices of white bread to piece together. I used my bread knife to cut them all evenly, cutting them stacked two at a time in order to get two equal huge “slices” of bread. It ran 3 across and 4 down. We spread out the butter. I’d had it out to soften up for a while, but it was still hard, so I nuked it twice for 5 seconds each and that did a great job. 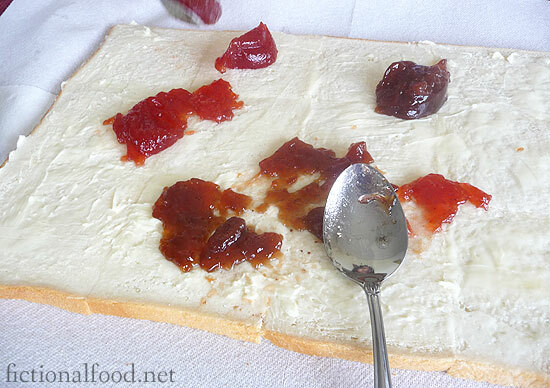 We scooped out strawberry jam, but were really disappointed in the Smuckers jam. It looked brown and gross and so luckily, I had also bought two jars of guava strawberry jam. We switched to that and it had a much brighter red color. We slapped and slammed it around. Here’s the bottom half, all jammed up! All that was left was to put the top pieces back on. 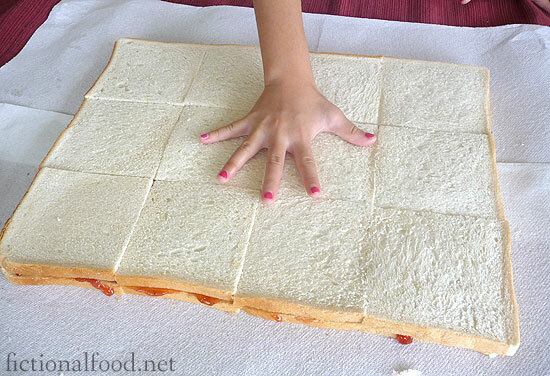 Here’s the finished sandwich with her hand on it for scale. I was sad you could see the cuts so prominently, but it didn’t matter at all to her. 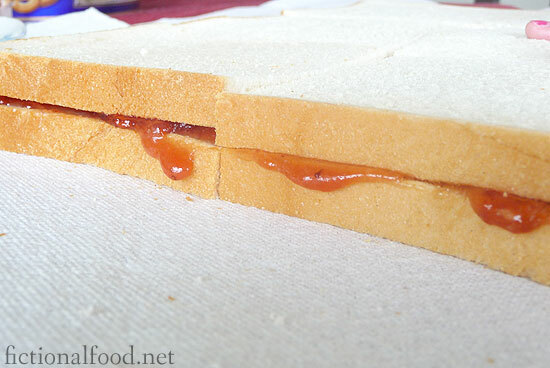 We started eating sandwiches and between bites, she grinned her toothless grin at me and said, “We’re the best jam sandwich makers in the whole world!” We packed the sandwiches into ziploc bags for them to take to school as their snack. 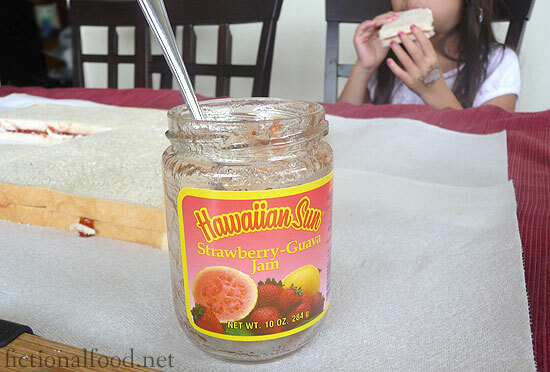 As you can see, the Strawberry Guava Jam is all gone! As for the leftover crusts, we’ll make them into croutons. In the meantime, she used them to construct a castle. While there really wasn’t much to this one, she had a ton of fun with it, so that’s the main thing. My son, on the other hand, was less than impressed. I asked if he wanted to see it, he comes over and takes one look and says, “That’s it? !” WHATEVER, BOY! MAKE YOUR OWN! 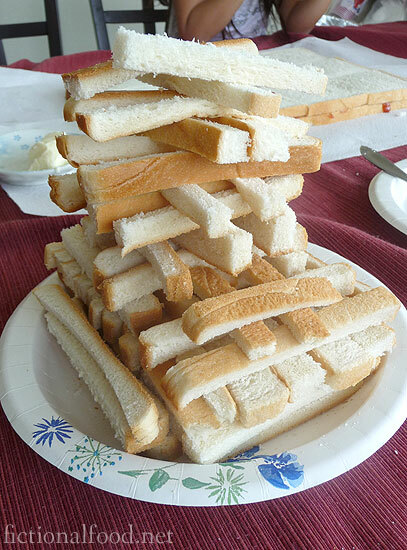 Stack the bread two at a time and cut off different edges to piece together to make two slices of “giant” bread. 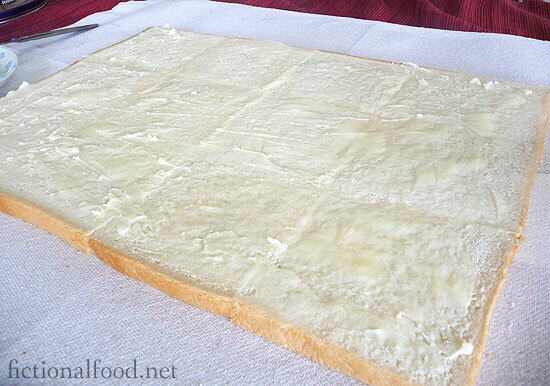 Lay out all the pieces for the bottom slice and spread with butter. If butter is too firm, microwave for 5 seconds until soft, but not melted. Lay the pieces for the top slice out on top. Have a feast for a hundred weeks!